Batter is the basis for so many national and international dishes; from the simple lemon pancake to the magnificent toad-in-the-hole. Russian blini are pancakes made of buckwheat flour and yeast; popular French crepes suzettes are made of a basic batter with the addition of oranges and liqueur; fritter batter is another variation and American waffles are also a type of pancake. The successful adaptation of basic batter to suit different recipes depends on the proportions of flour, salt, eggs and liquid used. There are different versions, too, just to create confusion. The following are batter recipes I have used for years and-except when I’ve done something daft-they’ve never let me down! These quantities should be sufficient for 8-10 pancakes. The consistency of batter for pancakes should be like single cream. Sift the flour and salt into a bowl. Make a well in the middle of the flour (use a wooden spoon) and drop the lightly beaten egg into the well. Beat the mixture with a wooden spoon and then, slowly, add half the milk. Keep beating this mixture with a wooden spoon until the egg, milk and flour is thoroughly combined and no lumps of flour are present; use a whisk or hand-held rotary beater to complete this process if you prefer. 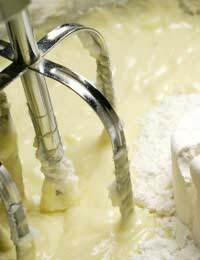 Once the batter is smooth, add the remaining milk and stir, whisk, or beat, until the batter bubbles. Before cooking pancakes, prepare your frying pan by heating 1 tablespoon of vegetable oil in it, then, add a shake of salt and wipe out with absorbent kitchen paper. This process is called seasoning a pan and its purpose is to clean and condition the pan before use. When you have prepared your basic pancake batter heat the seasoned frying pan but make sure there is no surplus oil remaining. With the handle of the pan slightly raised, pour in a small amount of batter from the raised side. A thin ‘skin’ of batter should cover the bottom of the pan as you shake it to and fro over the heat. Turn down the heat to moderate and either flip the pancake by tossing it up and out of the pan, or, use a non-scratch palette knife to turn the pancake over and cook until both sides are golden brown. When you need to cook several pancakes to be served together, they can be kept warm by putting them between two plates in a warm oven as they are made. Serve them rolled up and sprinkled with lemon juice and sugar with a wedge of lemon. Alternatively, fill the pancakes with a savoury filling of your choice. Cooked ham, mushrooms and cheese work well together and poached smoked haddock with peas, cooked prawns and Parmesan tastes great, too. Traditionally, Yorkshire pudding was cooked in a baking tin, cut into pieces and served with gravy before any meat was eaten. This was intended to fill hungry stomachs with the cheaper food and so save the more expensive meat. The individual Yorkshire puddings we make are really called ‘popovers’. I blamed various different ovens for not being able to make Yorkshire puddings and my family looked forward (with interest and amusement) to the latest batch of Yorkshire ‘biscuits’ or ‘flannels’ as they called them. One day it ‘just went right’ and has remained that way! Prepare the batter by sifting the flour and salt into a mixing bowl, then, make a well in the centre and drop the 2 beaten eggs into the well. Stir the water and milk together in a jug and gradually add half this liquid to the flour and eggs, beat it well to combine the ingredients. Beat in the rest of the liquid until it bubbles. Heat the dripping in a baking tin (18cm) at a preheated oven temperature of 220C. The fat will get really hot and begin to look hazy. Pour in the batter (give another good stir if it has been standing) and bake for 40 minutes without opening the oven door or lowering the temperature. Serve Yorkshire puddings immediately; they do not wait! For 4 servings of toad-in-the-hole, place 450g pork sausages in a greased roasting tin in the oven-preheated to 220C for about 10 minutes. Remove the tin from the oven and pour 300ml of prepared batter over the sausages. Return the tin to the oven and cook for 30-40 minutes, when the batter should be well-risen and golden brown. The trick with Yorkshire puddings is to have the oil in the moulds, really hot before putting in the mixture. Normally as Yorkshire puddings are served with roast beef, personally I do this by putting oil in the mould and the moulds in the bottom of the oven when the meat first goes in and they work every time.